Description: This is a great stamp of a Moon Panel. Made by Stamp Oasis. A wonderful addition to any stamp collection. Can be used for any craft project where a Celestial flair is needed!! Size: 1 3/4" x 3 3/4"
Description: This is a great stamp of a Sun Panel. Made by Stamp Oasis. A wonderful addition to any stamp collection. Can be used for any craft project where a Celestial flair is needed!! 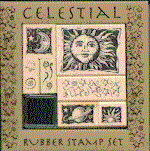 Description: This is a Celestial Sun stamp. Made by All Night Media. Will make wonderful collage projects and look great when colored with Pearl Ex!! Description: This stamp is called Marvelous Moon and is made by All Night Media and comes to you as part of the Posh Impressions line by Dee Gruenig. This nice stamp also has Stars hanging from it for a very Celestial look. Description: This 8 piece wood mounted rubber stamp set is wonderful for all your card making ideas. Celestial theme with a mini black ink pad. Set by All Night Media. 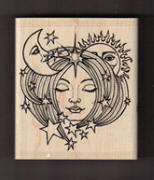 Description: From Hero Arts comes this 3 piece set of stamps called: Sun, Moon & Stars. Each stamp has a different image shown at right. Size: Each stamp is 1 3/8" x 2"
Description: From Hero Arts comes this great celestial stamp that is called: Moon Sky. This would make a nice background too. Description: From Hero Arts comes this great celestial stamp that is called: Sun Sky. This would make a nice background too. Description: This fun stamp is made by Stampington & Company and is called a Small Stretched Star. This stamp also comes in 2 other sizes sold here. 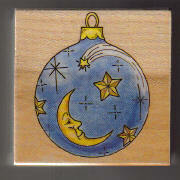 Size: 1 3/4" x 1 7/8"
Description: This fun stamp is made by Stampington & Company and is called a Medium Stretched Star. This stamp also comes in 2 other sizes sold here. Size: 2 1/4" x 2 5/8"
Description: This rubber stamp by All Night Media is discontinued. Perfect for people who like Celestial images and can be used on a Christmas Card. Size: 2 14" X 2 1/4"
Description: This is a wonderful stamp from Stamp Oasis. Perfect for collectors of celestial images. Imagine the different ways you could emboss and color this large image. Size: Image size is 3 1/4" X 3 3/4"